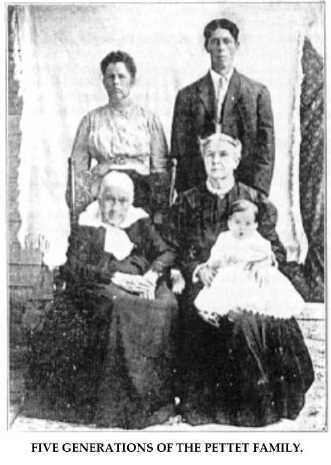 children have been born to Mr. Vannice and wife: Avalo P., married and living in Broken Bow, has one child; Ross W. deceased; Ashbel W., a preacher of the United Brethren church, is unmarried and lives at home; Chester, deceased, and Merlin C. The first two were born in Iowa and the other three on the homestead farm. Mr. Vannice and his wife have been active along educational and social lines and have done their share to advance the general progress and welfare of their county and state. He has held various township offices. The parents of Mr. Vannice are both deceased; his sister, Mrs. Leah Hukill, lives in Mediapolis, lowa, and his other sister, Mrs. Emily Zerber, lives at Grand Junction, Colorado. For over forty years the gentleman above named has been identified with the agricultural interests of Howard county, Nebraska, and has aided materially in transforming this locality from its wild natural state into a thriving farming district. Mr. Baxter is a gentleman of unusual perseverance and energy, who has met with deserved success in his labors, now being classed among the leading, citizens of his community. James Baxter was born in the County of Cumberland, England, on the first day of December, 1837, and was the second child in a family of four, he being the only boy. His parents died in England, and two sisters still live there, while the third also is dead. Our subject made England his home until his thirty-second year, then came to America, landing in New York in August, 1869. He went directly to Kalamazoo, Michigan, accompanied by Mr. Alex Lamb, who came from England with him. There Mr. Baxter engaged in the stock business, as he had followed farming and stock buying for many years in England, and he remained in Michigan until March, 1871, at which time he went to Dubuque county, Iowa, spending a few weeks with old friends James and George Irvine, sketches of both of whom will be found in this book. Mr. Baxter's first sight of Howard county was in the latter part of March, 1871, when he arrived here in company with the Irvine boys and Alex Lamb. This party of men were among the first, if not actually the first, resident settlers of the county, and Mr. Baxter still relates in a very interesting and amusing manner their early experiences here, particularly of their crossing on the Loup river, as there was at that time no way of crossing the stream except by fording it and taking your chances of striking the best spot for so doing. They had an ox team and load of supplies, and in trying to get to the opposite side were forced into the deep channel of the river; when part way across they were obliged to turn the oxen loose, and, taking their load in small quantities, after making four or five trips, managed to got it all safely over. They then floated the wagon front and hind wheels of the wagon over separately. So far as is known, this is the first fording of the river made in Howard county by white men. In April, Mr. Baxter homesteaded on northwest quarter section twenty-five, township twelve, range fourteen, and this land is still in his possession. He has seen every change that has come to the locality, doing his full share in bringing about the prosperity now enjoyed there, and incidentally has built up for himself a comfortable fortune, at the present time being proprietor of nine hundred acres of choice land which is divided into several fully equipped farms. Mr. Baxter has himself retired from active management of the farm, his sons relieving him of the burden, while he with his wife and three unmarried children, reside in a pleasant home in Farwell. Mr. Baxter was married at Grand Island, Nebraska, on December 26, 1873, to Christina Irvine. Mrs. Baxter is a native of Scotland, coming to the United States in 1872, in order to join her brothers George and James Irvine, mentioned above. Eight children have been born to Mr. and Mrs. Baxter, named as follows: Jane, wife of Frank Dodd, they living in Alberta, Canada, and having a family of seven children; Thomas and James A., both married and farming in Howard county, the latter working the original Baxter homestead; Archie W., Albert H and Mary Ethel, living at home. One son and a daughter died during babyhood. Portraits of Mr. and Mrs. Baxter will be found on another page. Mr. Baxter has always been prominent in local affairs holding different precinct offices. In 1885 he was appointed county clerk to fill an unexpired term, and for thirty-five years served as justice of the peace in Kelso precinct. 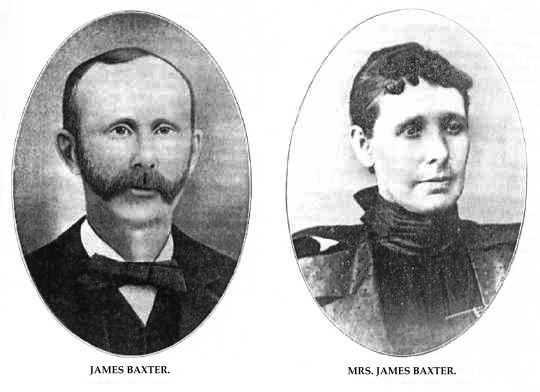 James Baxter and Mrs. James Baxter. George Hecht, the eldest living son of venerable Chris Hecht, was born at Joliet, Illinois, September 22, 1859, and was reared here and in Kankakee county, spending most of his youth on the farm. When the family moved to Grant Park, Illinois, George learned the carpenters trade, and during the two years prior to their migration to Nebraska, he was employed by the Pullman Car Company at Pullman, Illinois. His first work was roofing the water tower at an elevation of two hundred and thirty-five feet from the ground, from which Michigan City, Indiana, forty-five mile distant, was visible on clear days. from time to time when farm work was not pressing. In 1903, the family moved to own [sic] and Mr. Hecht, with his brother Charles, engaged in farm implement business, dealing in buggies and automobiles in addition to the usual stock; in the spring of 1911 Mr. Hecht bought his brother's interest and is sole owner and proprietor of the business. Mr. Hecht was married at Pullman, Illinois, April 10, 1882, to Miss Ada A. Russell, a native of Utica, Oneida county, New York, a daughter of Simon and Eliza A. (Blake) Russell. Mr. and Mrs. Hecht have had six children born to them, five of whom are living: Clarence C., engaged with his father in business, was married to Miss Cora Hoops, of Seward, Nebraska; their daughter, Marjory L., was the first great-grandchild, and formed one of a group of four generations of the family. George F., is an auto expert mechanician in charge of his father's auto department; Alice, who graduated in the Plainview high school, married Edward Hadik, who is now farming in Knox county; Leseter, and Russell, who are attending the Plainview schools. Mr. Hecht has, like his father, been a republican since attaining the franchise, and cast his first vote for McKinley, who, like his father's first candidate, suffered the assassin's ball. Mr. Hecht, with his family is a member of the Congregational church, and he is also a member of the Masonic order, of which he served as Worshipful Master ten years, and is now treasurer of the Chapter of the Eastern Star. He is affiliated also with the Independent Order Odd Fellows and Modern Woodmen of America lodges. Mr. Hecht has seen the development of Nebraska from the open, unsettled country to the highly developed, prosperous community it now is. In the early days, feathered game was plentiful, and once in the spring of 1885, he came in sight of four deer when on a hunting trip east of his home, but none of the party came close enough to get a shot at the large game. Prairie wolves were plentiful and at times made depredations on the settlers' young stock. The dangers of blizzards and prairie fires kept the settlers on the alert, but withal they enjoyed life as much as do the young folks now; every one was helpful, hopeful, and considerate. James Franklin Irvine, one of the well-to-do younger members of the farming community of Howard county, is a gentleman of energetic habits, who has been most successful and prosperous in his chosen work. He was born in the county in which he now resides, first seeing the light on March 23, 1878. James F. Irvine is the eldest son of George Irvine, who was one of the first settlers and whose home was the first building erected in the settlement of Howard county. He now resides in Kelso precinct on Oak creek, where he owns a valuable estate. Our subject grew up on the home farm, receiving his early education in the local district schools, later attending the Grand Island Business College, from which he was graduated in 1898. After leaving school he engaged in farming on his own account, purchasing the old Oak creek farm, containing about three hundred and twenty acres. This land was owned by his uncle, James Irvine, and was a well improved tract. He worked this place up to 1906, adding to its value in many ways, and disposed of it at a very good profit. He then purchased one hundred acres situated on the North Loup river, lying about miles northwest of St. Paul, in section seventeen, township fifteen, range eleven, and has made of this a fine property, having the place equipped with every convenience for conducting a model farm, and all the land is under cultivation. He is progressive in his methods and a thoroughly practical farmer. Mr. Irvine was married on March 28, 1900, at Nysted, Nebraska, to Sophia Caroline Mortensen, the Rev. Peterson officiating. Mrs. Irvine comes of a prominent pioneer family in Howard county, her father, Rasmus Mortensen, having settled in this part of the state in 1873. Mr. Mortensen was born at Odense, Finland, and there married Josephine Magdeline Larson, who was born in Salkenberg, Swenden [sic]. They came to America in 1873, and immediately emigrated to Howard county, Nebraska, where Mr. Mortensen bought the Paul Anderson homestead of one hundred and sixty acres. This was their home place until Mr. Mortensen's death, November 20, 1897. Mrs. Mortensen continued to live on the farm in Warsaw precinct until 1900, when she moved to Dannebrog, which has since been her home. Four children have come to bless the home of Mr. and Mrs. Irvine: Earl Clayton, Ethel Viola, George Lee, and Ray Franklin. Mr. Irvine takes a commendable interest in local affairs, and in 1902 was elected county assessor. Among the early settlers of the state may be mentioned the above gentleman, who has since 1890, lived in the city of North Loup, although still superintending his large estates, situated in Greeley and Valley counties. He is regarded as one of the leading citizens in this part of the state. Mr. Shepard was born at Canton, in the Old Bay state, February 22, 1836, the fourth in a family of five children born to George and Almira (Bailey) Shepard, natives of Canton and Scituate, Massachusetts, respectively. Of these five children, only two besides the subscriber still survive. One brother lives in Illinois and one sister is a resident of Nebraska. family moved to Warren township, Lake county, Illinois, and here near Littleport, now Waukegan, he grew to manhood and received his education in the common schools. On August 14, 1866, he was married to Miss Cordelia Raydure, a native of Meadville, Crawford county, Pennsylvania, a daughter of John Stafford and Desolate (Quigley) Raydure. An interesting bit of family history may be told in connection with the mothers peculiar name. The grandmother, Rosa Mushrush, came with her brother Michael from Germany, and settled near Meadville, where each secured seven hundred acres of land. Here she married, soon after which her husband, Mr. Quigley, disappeared. During this period in her grief she so frequently exclaimed, "I am so lonely and desolate!" and when twins were born, she named them Mary Lonely and Nancy Desolate. When of school age she took them on horseback through the trackless wilderness a hundred miles, to Pittsburg, while she and their Uncle Michael walked, and left them at a convent until they were fifteen years of age, not seeing them during these years, on their return home, Desolate taught school eleven years, until her marriage at the age of twenty-six, on her birthday, April 1. She died in April, 1890, at the age of eighty-five. In the year following his marriage, Mr. Shepard removed to Omaha, Nebraska, and for a time followed the carpenter's trade. However, in less than a year they again moved, this time going to Platte county, where Mr. Shepard pre-empted a quarter-section at Duncan, part of their old farm now being within the limits of the town. They remained here for five years. While in this county Mr. Shepard held his first public office, being appointed postmaster of Jackson, now Duncan, under the Grant administration, and serving one term. In 1872, Mr. Shepard and family moved to Greeley county, and took up another quarter-section, under the homestead act, near North Loup. This homestead remained the family home until 1890, when Mr. Shepard retired from active labor and moved into the city of North Loup, where he his since built a comfortable home. He owns now considerably more than two hundred acres of well-improved land as well as his home, comprising four acres, in North Loup. For years he has given considerable attention to stock raising and has met with great success. Mr. Shepard has lived in the state for forty-five years and has become, familiar to many in that section and takes a foremost place among them as an energetic farmer and public spirited citizen. He has experienced all the trials and hardships of a pioneer's life in the west. He has always taken a hearty interest in the development of the community and has aided materially in the advancement of public enterprises. While living in Greeley county, Mr. Shepard served the public as county commissioner, elected on the republican ticket, his term of office lasting two years, he having resigned on removal from this county. Mr. and Mrs. Shepard have two daughters, one of them, Maud Amber, is a teacher and the other, Marion, is still at home. In social and educational lines, the family have attained considerable prominence. Mrs. Shepard is a member of the Methodist Episcopal church. Like most of the pioneers of the west the Shepard family lived in a dug-out, this one having a log front and a sod roof. A year later he built a two-story log house with a basement, a most pretentious house in those days. The logs from which it was built were hauled from Cedar Canyon near Burwell, some thirty miles distant, covered with siding and plastered inside, it is still in use, a very comfortable dwelling. Otto F. Linstadt, one of the old settlers of the region where he now resides, occupies a good home and valuable property in section thirty-three, township twenty-two, range two; he has always done his full share in the developing of his region and is well-known as a progressive and energetic citizen. He and his family live in their comfortable home, where they are surrounded by a large circle of friends and good neighbors. Mr. Linstadt is a native of Pomerania, Germany where his birth occurred November 2, 1871; he is a son of Carl and Caroline (Langish) Linstadt, who were also natives of Germany. In 1875, when but a small child, our subject left Germany with his parents, embarking on a steamship at Bremen, which was bound for New York. After landing in the United States the family came to Nebraska, coming by way of Columbus to Madison county, where they took up a homestead in Kalamazoo township. The family much preferred the sod house for a dwelling, and lived in three different "soddys" during their residence on the homestead; this style of house was comfortable all the year round, being cool in the summer and warm in the winter. Columbus was the nearest market place in the pioneer days, a distance of thirty-five miles having to be traveled by ox team to haul grain to market, the journey there and back consuming three days. prevailed then thronghout that section of the country. Mr. Linstadt was united in marriage in 1902 to Miss Anna Huber, a native of Fairview, Nebraska, and Mr. and Mrs. Linstadt are the parents of four children, namely: Walter, Lenora, Willard, and Harold. They are a fine family and enjoy the respect and esteem of all who know them. In 1906 Mr. Linstadt bought his present farm, which is known as the Joe Wangel homestead. He has steadily improved the place since his purchase, and now has a fine farm and good home on same, where he and his family are surrounded by a host of good friends and neighbors. Mr. Linstadt owns "Rock," one of the finest Percheron stallions in that part of the country. Charles C. Cooper is recognized as one of the substantial business men of Ansley, Nebraska, and is one of the younger men among the early settlers of Custer county. He is a native of Putnam county, Illinois, born March 19, 1876, one of a family of six children and third in the order of birth. His father was of English descent, born in Pennsylvania, and died in Burt, Iowa, in 1907. The mother, of Scotch descent, was born in Michigan, and now lives at Algona, Iowa. Of their children, besides Charles C., there is a son living in Chicago, a daughter in Los Angeles, a son in Sioux City, a daughter in Neligh, Nebraska, and one son is deceased. In childhood Charles C. Cooper was brought by his parents to Iowa, receiving his education in the country schools. About 1890 he came to Custer county and afterward attended Omaha business college, graduating in 1904. He worked in a bank two years after leaving school and then took up dealing in real estate, which has since been his occupation. He is a wide-awake, enterprising business man, and has won a good standing in the community. Mr. Cooper was married on June 28, 1905, at the home of the bride's parents in Ansley, to Miss Mary Sharpless, a native of Illinois, who had been a teacher in Nebraska, to which state she came with her family in 1885. She is a daughter of James F. and Martha (Fyffe) Sharpless, and a sketch of her father, who is now deceased, may be found in this work. One child was born of this union, Emma Laura. In 1907 Mr. Cooper erected a fine modern residence, where he and his family have since resided. He and his wife are well known socially and have a large number of friends. William Damme, a prominent farmer of Wayne county, resides in his comfortable home on section five, township twenty-five, range two. He is well-known throughout this portion of the country, and is one of those substantial citizens whose integrity, industry, thrift, and other sterling virtues have added so much to the material wealth of the state. Agriculture forms the basis of wealth in most sections of the western United States, and it is therefore of great importance that the people who inhabit the great farming regions should display these elements of sterling worth which are so noticeable in the character of our subscriber. Mr. Damme is a native of Missouri, where he was born September 18, 1855. His parents, William and Lottie Damme, were both natives of Westphalia, Germany. They emigrated to America when young - William Damme, senior, coming with his parents, and Mrs. Damme, with some cousins. They were married in Missouri. Their sailing vessel was six months on the way. The father owned and operated a farm in Franklin county, Missouri, on which he lived at the time of his death. He is survived by his widow, who still lives on the old place. She made a trip back to Germany in 1910, after having lived in America sixty years. The childhood of Mr. Damme was spent in Missouri, where he obtained his education. He helped his parents about their farm during his spare time, thus early being accustomed to the life of a farmer. In 1881, he started for himself, coming to Otoe county, Nebraska, and settling on a rented farm. Five years later, he came to Wayne county, and bought the old Merriman homestead of one hundred and sixty acres, which has been his home ever since. He has improved the farm considerably from time to time, as his means permitted, and now has a comfortable home, and one of the finest farms in the community. One noticeable improvement is the fine orchard and grove which form a striking feature in the landscape. He now owns two hundred and forty acres of land. In 1883, Mr. Damme was married to Miss Albertena Schutt, of Missouri. They are the parents of flfteen children, named as follows: Ed, Minnie, William, Mertha, deceased, Fred, Mary, John, Herman, Clara, H. Henry, deceased, Lottie, Johanna, deceased, Carl, Benjamin, Albert. Mr. and Mrs. Damme are members of the German Lutheran church, and Mr. Damme is a republican in politics. Prominent among the residents of Palmer, Nebraska, is the gentleman above named who has lived in Merrick county for over thirty-two years or more, and in this section of Nebraska since 1877, and has been closely identified with the development and civilization of this part of the state. other in Idaho, one brother in Idaho, and another in Palmer; the father died in 1882, at Palmer, and the mother in 1879, at Cedar Rapids, Nebraska. 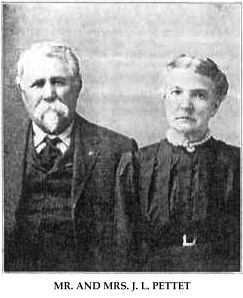 Mr. and Mrs. Elias Burkman came to Boone county, Nebraska, from northern Iowa, in 1872, where Mr. Burkman took up a claim of one hundred and sixty acres near the town of Cedar Rapids. This continued to be his home until Mrs. Burkman's death, when he sold and afterward made his home with his son, Warren. When a small child, our subject went with his parents to Scott county, Iowa, remaining but two years, then returning to Ohio for a year; and in 1859 the family went again to Iowa, and in 1860 moved to Illinois. On March 6, 1867, Mr. Burkman was married to Miss Elma Folsom, of Wisconsin, and made their first home in Hancock county, Iowa. In July of 1877, Mr. Burkman came with his wife and three children to Boone county, Nebraska, one year later going to Nance county; coming on into Merrick county, in 1879, where he purchased one hundred and sixty acres of land in section twenty-two, township fifteen, range eight, which remained the home for twenty-eight years. In 1909 Mr. Burkman retired from the farm and moved to Palmer, Nebraska, where he purchased a fine home where they now live. He has been a prosperous man of affairs. And at one time owned two hundred and forty acres in Merrick and Nance counties. This he sold and bought one hundred land sixty acres, which he still owns. He served as director of his school district number thirty-one for six years. Mr. and Mrs. Burkman have had five children: Genevieve, wife of David Baird, resides in Clarks, Nebraska; Frank, who is married, has eight daughters, and one son, and lives in Merrick county; Bert, also married and residing in Merrick county; Clifford, married, has one son, and lives in Merrick county; and Pearl, who is the wife of Charlie Yarmon of Palmer. Mr. and Mrs. Burkman are among the earlier settlers of the county, have passed through much of the early history of their locality, and are widely and favorably known. Detlef Hafner, an agriculturist of prominence in Knox county, resides in Morton township, and is one of those substantial citizens whose integrity and industry, thrift and economy, have added so much to the material wealth and growth of Nebraska. Mr. Hafner is a native of Germany, his birth occurring in the province of Holstein, in the year 1856. He is a son of John and Mary (Lange) Hafner, who were both natives of Germany. The father served his native country in the war between Germany and Denmark. In 1881, Mr. Hafner, with his parents, left the fatherland to come to the new world, where there were better opportunities for a man to get a start in life. After landing in the United States, the family proceeded directly westward, locating in Omaha, Nebraska, where they remained five years. Our subject then came to Knox county, Nebraska, in 1886, where he bought school land, which he greatly improved during the years, and has steadily added to his land holdings until now he six hundred and forty acres of fine land. Mr. Hafner has experienced the many hardships, and discouragements that the early settlers of the western frontier had to endure, and among other incidents, the memorable blizzard of January 12, 1888, proved about as destructive as any, our subject losing nearly all his stock in the icy biting blast, and whirlwind of ice dust. In 1893, Mr. Hafner was united in marriage to Miss Mary Ellieason, and Mr. and Mrs. Hafner are the parents of four children, named as follows: Henry, Ernest, George and Edna. Mr. and Mrs. Hafner and family are highly esteemed and respected in their community, and live in their pleasant home, which is located in section sixteen, township thirty, range three, where they are surrounded by a host of good friends and acquaintances. In politics, Mr. Hafner is a republican, and he and his family belong to the German Lutheran church. Prominent among the old settlers of Nebraska, is J. Osman Trine, who, since the fall of 1868, has made the northeastern part of the state his home, and has done his share in the developing of the agricultural resources of this section of the country. Mr. Trine lives on section thirty-one, township twenty-two, range one, east, in Stanton county, where he built up a valuable property through his industry and good management. Mr. Trine is a native of Iowa, his birth occurring in the year 1858; he is a son of William and Rachel (Stewart) Trine, both of whom claim Ohio as their native state, and of Welch and German descent respectively. Mr. Trine's father came to Iowa in the year 1852, coming by boat to near Brighton, Iowa, where he remained until 1868. In the same year the family came to Madison county, Nebraska, where the father took up a homestead. His brother, our subject's uncle, had preceded them, and was living on the ranch known at that time as the Walter Craig ranch, and R. Clark ranch, who owned township twenty-one, range one, east. those days was at Columbus, many miles distant. Deer and antelope were plentiful in those times, and were frequently seen. In 1882, Mr. Trine, our subject; bought his present farm and has steadily improved same until now he has a beautiful home and five hundred acres of fine land, ten acres of which are given to trees. Mr. Trine was united in marriage, in the year of 1882, to Miss Jessie Read, and Mr. and Mrs. Trine are the parents of six children, namely: Rettie, Floyd, Sterling, Ruth, now Mrs. Adam Young; Ralph, and Sarah. They are a fine family and enjoy the respect and esteem of all who know them. William Schlecht who resides in section twenty-three, township twenty-five, range eight, in AnteIope County, Nebraska, is one of the leading old timers in this section who has always done his full share in the betterment of conditions throughout the comunity in which he lives. Mr. Schlecht is indeed an old settler of northeastern Nebraska, having lived in this part of the state for the past forty-eight years, Mr. Schlecht's home in the location above mentioned shows thrift and prosperity. When coming to Antelope county in 1901, he brought the Ernest Michel homestead, and now owns eight hundred acres of good land and has forty acres of fine orchard and grove trees. Mr. Schlecht is a native of Manitowoc, Wisconsin, where he was born January 20, 1860. His father Ernesch Schlecht was born in Saxony province, Germany, November 25, 1839, He served in the army of his native land for three years before coming to America. He arrived in New York with very little money, in fact after paying for lodging he had but twenty-five cents left. Fortunately, however, he succeeded in locating friends from the old country, and in this way secured employment and later went to Manitowoc. He died July 3, 1909 in Cuming county, Nebraska. The mother of our subject, Amelia Reffell, was born in Pommer province, Germany in 1844. Mr. Schlecht's parents came to America in a sailboat and were six months making the voyage. Troubleous times beset them almost from the start. While his mother was on the sea, an epidemic of cholera broke out and in this epidemic she lost her brother-in-law and her nephew. On arriving at New York, more trouble was in store and they were quarantined on account of small pox, for some time. After reaching New York they proceeded to Wisconsin where they bought land and resided until 1862, when the family, including our subject, moved to Cuming county, Nebraska, where they took up a homestead claim, on which they built a dugout. In coming here they drove an ox team from Wisconsin, and were six weeks on the way. When they came to Cuming county there were only fifteen settlers living there; and during the first winter there, three people froze to death. In those early days of the first pioneers words are almost inadequate to express the experiences and hardships endured by the handful of people who braved the unknown dangers and struggles that were before them. Among some of the dangers and disappointments endured were scares caused by the Indians who infested the unpopulated western country at that time, loss of crops by grasshopper raids and hot winds and they also fought prairie fires to save their property and lives. August 20, 1885, Mr. Schlecht was united in holy matrimony to Miss Tillie Loeue, and Mr. and Mrs., Schlecht are the parents of five children, whose names are as follows: Ernest, who is married to Miss Vera Johnson; William; Matie, who is the wife of Mr. Ferdinand Rankie; Henry and Laura. In 1901 Mr. Schlecht came to Antelope county, Nebraska, and bought land, and now resides on the Ernest Michel homestead, and as before stated, owns eight hundred acres of land, and forty acres of fine trees. His home is known as the Clearwater Stock Farm, stock-raising being Mr. Schlecht's principal business, and in which he takes a great interest, and he is particularly interested, in raising Duroc Jersey hogs of which he has a nice herd. Frank L. Beals is one of the younger men of Custer county who are prominent in financial and business circles, and he is recognized as a man of sterling qualities and business ability and integrity. He is now manager of the Farmers' Bank of Merna, one of the leading institutions of Custer county, with a paid up capital of fifteen thousand dollars, and whose charter was granted January 19, 1909. The president of the company is B. F. Cox, the vice president E. H. Daley and the cashier Frank L. Beals, who is also the active manager. The bank was organized by pioneer settlers of the county and its officers have lived in the county for many years. The company, owns a modern bank building and has it well equipped room for the transactions which are carried on there. This is considered one of the solid financial institutions of central Nebraska and has already won a wide reputation for modern methods and sound business principles. Mrs. A. D. Hunt, of Custer county, and Nellie, Mrs. Edwin Hewett, of Spokane, Washington. Frank L. Beals lived on the farm in Custer county until 1906, when he located in Anselmo, and in January, 1909, he came to Merna and assumed his present business connection. He was married in Anselmo December 20 1908, to Jessie Parkison, and one child has been born of this union, Ruth Helen. Mr. Beals and his wife are prominent in social circles and he is a member of the Masonic order. Both are highly regarded by their many friends and are always ready to do their share to promote the general welfare and prosperity of their county and state. James L. Petet stands at the head of a family that has long been held in high respect in Custer county, and has passed through various stages of the development of the region. He was born in Knox county, Illinois, September 30, 1839, the eldest child of Lewis and Nancy Petet, and their only son. His parents died when he was about seven years of age and he and his sisters were taken to the home of their grandparents in Iowa. He lived on his grandfather's farm, until his thirteenth year, then went out to work for others. In the spring of 1861 Mr. Petet enlisted in Company B, Third Iowa Volunteer Infantry, remaining in the service until the spring of 1864. He participated in many engagements, among them the following: Kirksville, Missouri, August 20, 1861; Shelbyville, September 2, 1861; Blue Mills, September 17, 1861; Shiloh, Tennessee; Metamora, Mississippi; Greenville, Vicksburg, Jackson and Canton, Mississippi; Atlanta and Ezra Chapel, Georgia; Corinth, and the siege of Atlanta. He received an honorable discharge as a veteran and was mustered out at Davenport, Iowa. At the siege of Jackson, Mississippi, the Third Iowa was practically annihilated and the remnant of the regiment was attached to the second. His father had fought in the Mexican war and his death occurred on the Gulf of Mexico, while returning from service. After his discharge Mr. Petet returned to Marion county, Iowa, where he engaged in farming. On June 26, 1864, he married Martha L., daughter of Elias and Sarah M. Fuller. Her family were the first white settlers in Marion county, Iowa. They located on the Des Moines river and for some time their nearest neighbors were Indians. Mr. and Mrs. Petet spent the first few years of their married life on a rented farm, then purchased land in Marion county, on which they lived until the fall of 1880, when they came to Custer county, Nebraska, with a bunch of cattle for Mr. E. P. Savage. Mr. Petet took up a homestead in Custer county in the fall of 1883 returned to Douglas county, and the following spring came to live on it, driving through from Douglas county with teams and wagons. After proving his title to the homestead he took a pre-emption and lived upon it about six years. He continued to cary [sic] on farming and raising stock in the county until the spring of 1906, when he removed with his family to the town of Comstock. Mr. Petet and wife have been residents of Custer county since the fall of 1883, and they have the respect and esteem of a large number of friends. He is a public-spirited, enterprising citizen and interested in all that pertains to the general welfare and prosperity. As he says himself, he has at times been "at the top," and at other times, "down and out at the heel." He was left an orphan at a tender age and early learned the lesson of self-dependence. He is the only one of his family now surviving. Mrs. Petet's mother made her home for several years with the family and died at the Petet home June 22, 1911, being in her eighty-ninth year. Mr. Petet and wife are active and vigorous and greatly enjoy the happiness of being surrounded by their descendants and friends in the eventide of their lives. Ten children have blessed their union, of whom nine now survive: Lewis A., of New Mexico, is married and has four children; James C., of Missouri, is married and has four children; Alice, wife of John Hiveley, of Hooper, Nebraska, has five children; Belle, wife of William Brown, of Comstock, has eight children; Bert, of Custer county, has four children; George, also of Custer county, has three children; Benjamin of West Comstock, has four children; Gussie, wife of Henry Eggers, of Chase county, Nebraska, has two children; Nancy, now Mrs. James Adams, lives in Comstock, and Amie, who is deceased. There are thirty-four grandchildren and nine great grandchildren in the family, and at a family reunion recently held in Comstock (1911) five generations were represented. An interesting picture of the Petet family will be found on another page of this work. Mr. and Mrs. J. L. Pettet. Five Generations of the Pettet Family. In listing the self-made men of Pierce county, Nebraska, who have become well-to-do agriculturalists and have aided materially in the development of the farming interests of this region, a prominent place is accorded Claus Hinrichsen. For many years this gentleman has followed this line of work, in the northeast quarter of section nine, township twenty-eight, range three, and has met with pronounced success is now known as one of the substantial citizens and well merits his high standing.